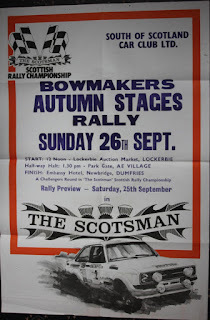 Long before the Internet and Social Media, rally publicity was dependent on local newspapers, club newsletters and the weekly 'Motoring News' event preview, and whilst seeking out historic information the other day, I came across an A2 sized poster for the 1976 Bowmaker Autumn Stages Rally. These posters were circulated around the route of the rally for display in garages and shop windows. 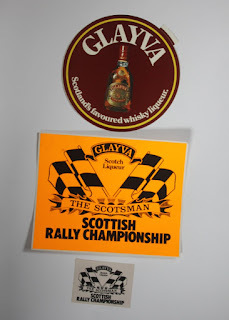 The Scottish Rally Championship itself was primarily sponsored by 'The Scotsman' newspaper at the time with additional support from Glayva Scotch whisky liqueur. Although the breathalyser was introduced some 10 years previously in 1967, spirit sponsorship in motor sport was still prevalent! 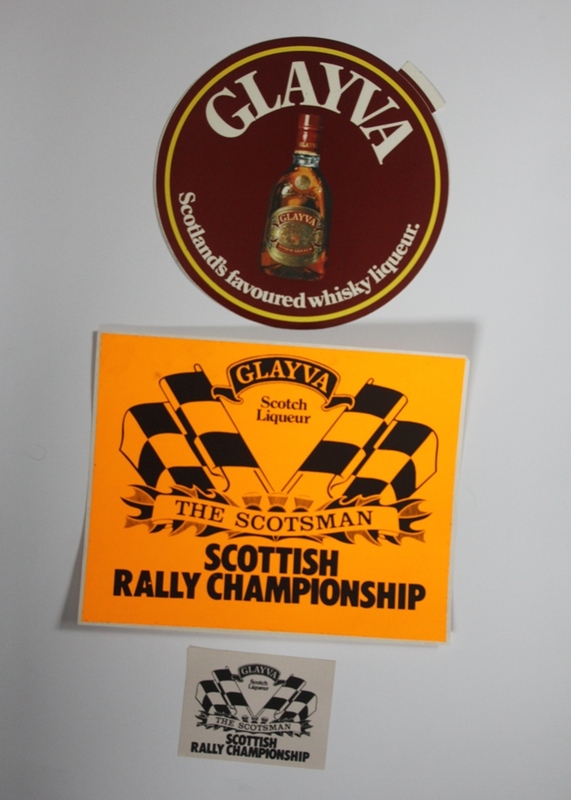 Also included in the Competitors' Pack were a Glayva sponsor's roundel, the 'exciting' brand new 'dayglo' orange championship decals and a wee white one printed on adhesive fabric which could be stuck on to rally jackets! Ain't new technology wonderful? 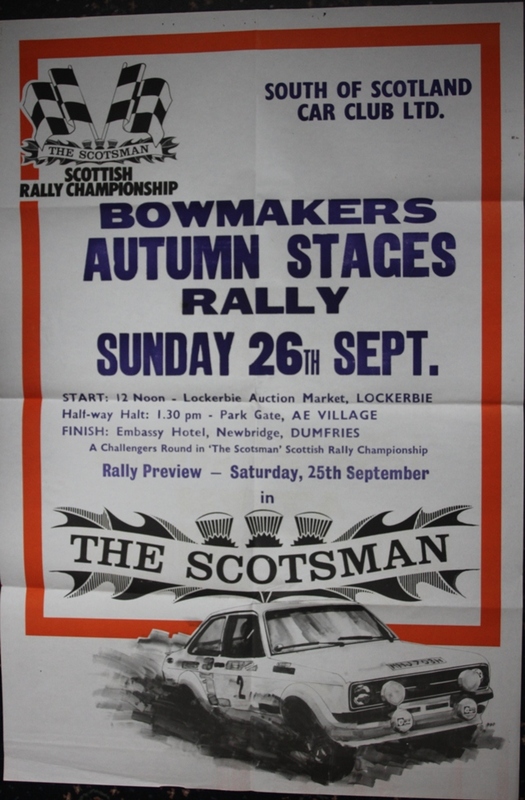 As you'll see from the poster, the Autumn Stages was a 'Challengers' only round in those days, but even then it attracted 'star' names. The first winner was Alistair Brearley in 1972 who won it the following year, then one James S. McRae from Lanark won it in 1975, with a certain Malcolm Wilson from Workington winning it in 1975 and who again won in '76. Malcolm Wilson was the top seed that year followed by Drew Gallacher, Murray Grierson and Ian Wilson. Alistair Brearley was running at number 6 ahead of Allan Arneil while further down the entry list were the likes of Dom Buckley (the Elder! ), Ivor Clark and Richard Stewart in his Ford Anglia. Even further down were John Cleland, Alastair McSkimming, Jim Carty, Barrie Lochhead and Robin Christie in an Austin 1800 in a full entry of 120 cars. The Entry Fee was £28.50, but there was a cash first prize for the winner of £65 while 2nd got 50 quid and 3rd place was awarded £35, plus a few bottles of Glayva were dished out. As a matter of interest, the 200 mile route contained 11 stages totalling some 60 miles of forestry roads, and this was supposed to be a 'small' event. Aye, them were't days, eh?